What happened to notifications? They worked perfectly fine for all these years but maybe in the last few months I don’t get them at all or very random. I don’t want to miss out on these streams. It’s great for watching my favorite streamers but lately I have been getting a glitch where I get no sound, it’s not my mobile device because I can just go in to another app and there is sound, please patch! Still crashing frequently. Now background playback is choppy and unintelligible. Every new version claims performance improvements and bug fixes, but so far things have only gotten worse. _________________ Crash crash crash, left right and center. Been crashing for several versions, over several weeks. Don't claim you fixed bugs and improved performance when the app still crashes constantly mid-stream. Can’t watch Twitch live, it stops and starts too often. I’m glad the streamers I follow upload VODs, those stream fine. I’m trying to watch Overwatch League and the twitch app crashes completely every two minutes whether I’m in the Command Center or not. Great but so hard to make a video. 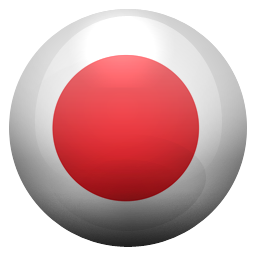 I can’t find a recorder for my Mac so can you make a recording app for twitch. Streams constantly freeze up. Comments for my own streams don’t even load half the time. Cant even watch my favorite streamers without having to resort to the website on a computer. Why even have a mobile app if it doesn’t even offer all the features that the desktop version does? This app has a tendency to freeze during streams and even crash. The browser is much better. Please bring a search bar to look up emotes easier for the iMessage app. I love using Twitch to watch streams but I hate the design of the app, finding a particular recent stream of someone you are following is unintuitive. This causes me to leave the app and watch other places. I on average watch Twitch streamers for 2-3 hours a day and it is my main form of entertainment. So it saddens me that the iOS app is riddled with so many issues. First off there is an insane amount of delay (15-30sec) which makes it very difficult to be involved in chat. While on my other devices the delay is essentially unnoticeable or very minimal (5-10sec) when I’m on mobile chat becomes separate and I no longer get the full twitch experience where I can be immersed in a community of other viewers. Having the app play in the background is riddled with issues and is extremely finicky. I can barely get it to play at times when I’d just like to listen in the background. Then when I go back to the app it pauses for a while consistently and then suddenly starts after waiting. Many times when I click on a stream it will be frozen without the option to press the play button. The only way to fix this is to reload the stream and sometimes it requires completely relaunching the app. 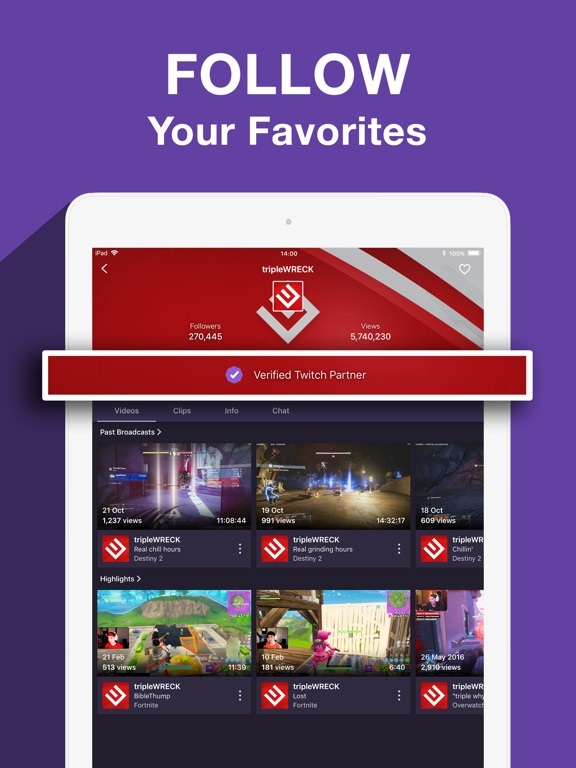 I love twitch and the app isn’t unusable by any means but it could really use improvements. What is really disappointing is that the iOS app has been around for so long yet we still deal with these bugs. Considering a large number of viewers are on mobile it is time some work was put in to polish the app and improve the experience of mobile users. I really hate trying to switch to desktop mode and it just forwards me to the app. Y’all should try to fix that just sayin.. but other than that love twitch! While watching a video, live streamed or not, I will click the button in the bottom right so I can watch the video and use other apps at the same time. When I click the button the video disappears and I have no way to open it back up.i click on the video again, nothing happens. I have to get out of the app to watch the video but I still can’t do what I wanted to do to begin with. It’s all about seeing new clips and enjoying and laughing to people but in a good way and see how they play and function. I love the twitch app. Great for watching streams, RCLS games, and OWL matches. The one problem I’ve been having recently is that the app keeps crashing whenever I try and type something in chat or I stay on one stream for around 45 seconds. It’s getting a bit annoying now because I’m not able to cheer bits anymore or watch streams that well. Please let me know if it’s a bug in the app or just my phone. 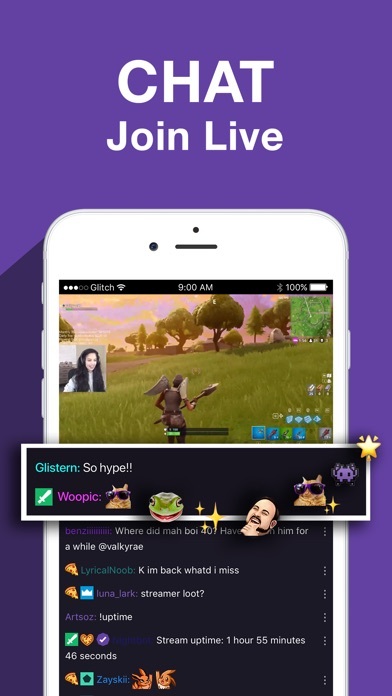 This app is always good for brand new streamers getting new to the gaming life/ watching there favorite streams from different people around the world. Everytime I switch to new channel I’m getting ads. Chrome cast takes forever/doesn’t load on a gigabit network. Since recent updates, the app keeps crashing after watching a few minutes. Very frustrating and the twitch support never responds. 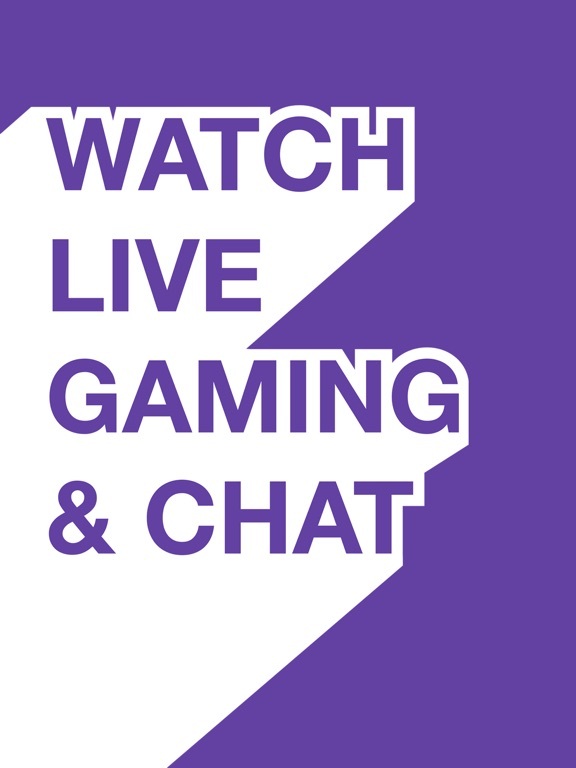 Do you love games, If you do, use Twitch for all of the games you love? The app itself works great. Until something happens to your account. Twitch support offers no help whatsoever. There is no phone number or chat line. You send them an email and then you don’t receive help from them for weeks and sometimes months. They are more than willing to help their affiliates right away but an average viewer I highly suggest not spending money because once your account is hacked, you won’t be getting it back. Flern I deleated my account and stopped using someone in another eastern country has been trying to sign in I continue to get emails saying successful log in sign in to your account, which I just delete . I downloaded the app because the website wouldn’t load any of the videos (even though I had three bars of WiFi) but after I made an account it would even let me login. I’d type in my stuff and it would flash to the home screen for a split second before kicking me back to the sign in page. This wouldn’t be a problem if there was a way to access the videos without having an account but apparently with the app that’s not possible. On IOS12.2 app keeps crashing while watching overwatch league. Not watching in command center. Will make 5 stars after fix. Sound randomly goes out while video still plays and video buffering while still connected to high speed WiFi. Every single time you look at a different highlight or video it gives you another 15 second ad. It gave me 5 ads in the spanse of 2 minutes because I was watching highlights and I immediately deleted the app. With this version, whenever I mirror my iPhone to my Apple TV, it will not play any of the Twitch streams from any streamer. It was a bit of a hassle to find this out today. Hopefully it will be patched soon. When I type in all of my information, I click sign up, and it just has a loading screen forever and ever and it won’t even work! Don’t waste your time guys!!! I enjoyed the app a lot until they started shoving the recommended streamers down my throat. I mean there’s a discover and a browse tab that the recommendations could be put under instead of the following tab. Think of changing it please. Never had a problem until recently. Now the app constantly crashes on iPad. Full screen mode leaves like 20% off screen now since the update. Please change it to where the screen just fits the contour of a regular iPhone. Tired of ads when switching streams. Latest patch has twitch ads every 10 minutes that make the whole stream need to reload. Don’t update, they didn’t add anything useful, just made it waste data. 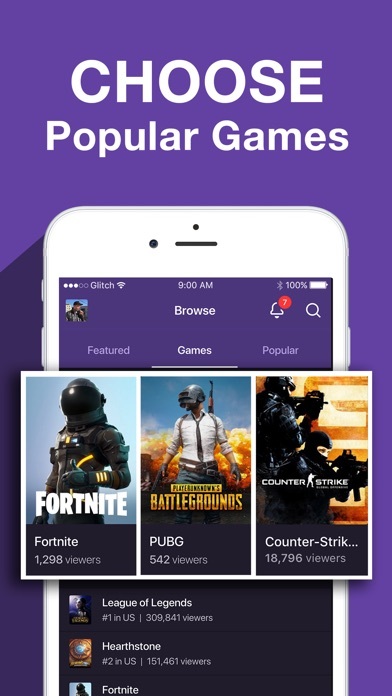 I have been using Twitch app for about two years now, and have always loved it overall. I think they have always been getting better, adding more and more to the mobile app with the addition of mobile subscribing, the ability to double tap for chat, mobile bits and all. But with this last update I’m very disappointed. I had fallen IN LOVE with the ability to swipe from one streamer on my feed to another and then back to check between them and see how they were doing in game etc. but I am extremely disappointed that it is no longer an option. That was part of why I liked the mobile app so much. I could go from one streamer to the next seamlessly and then back again after a few minutes to enjoy both and get into whoever was currently in a game or who I was in the mood for. Now that I have to go back out and minimize a stream to scroll and find the other streamer then do the same again to go back is downright a decline and a step back from such an amazing feature. 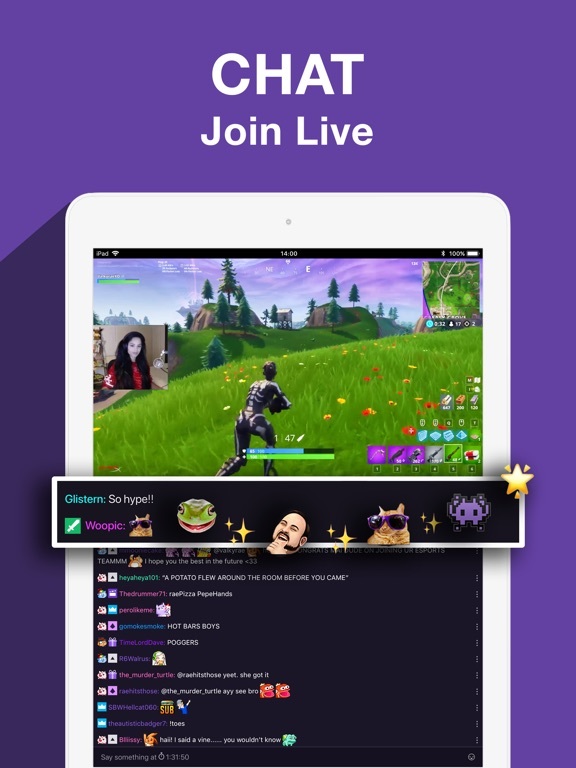 Over all the app still is good, allowing me to watch my favorite streamers with ease and interact with the chat fairly well but this feature was a must have and now I’m not sure I will be on the app as much. I’m very disappointed that they would take such a great feature with ease of use out of their app. I did not know this app defaults to auto play. Not to say there’s anything wrong with auto playing streams themselves but I was not aware of it and as a result I assumed a stream would end if I let the phone be. Halfway through a late night stream, I fell asleep without worries. However, I woke up and found my phone went from 100% to 13%. The streams stopped it from naturally falling into sleep mode after I unplugged it and set it to low power mode. This night of nonstop video playing no doubt harmed my phone battery’s maximum capacity, meaning it will be quicker to drop to 0% in the future and I did not intend for that. My suggestion is that you please make a pop up for mobile that stops the stream, live or otherwise, and asks the viewer “Are you still there?” after one or two auto plays have already occurred without outside input. If there’s no further response, the phone can fall into sleep mode. If there is someone still watching, they’ll tap ‘Yes’ and keep watching. Anyway, I’ve turned off auto play in settings, so this problem won’t happen for me again. But I still I wouldn’t want any people starting out with this app to make the same mistake I did. I used to never have problems with twitch, it was one of the apps I used to always get on and just watch a stream for fun. After a while I left because had life things to handle. But recently I decided it was a good time to get back on twitch. Was I wrong, yes and no. While the audio is fine without video, I’ve had troubles watching a stream and have audio at the same time. While the video plays just fine, it’s the audio that don’t work well on the stream. While I’ve been thinking maybe it could be my end, but when it’s been constant, I just don’t see the point in watching anything. Another thing, you removed the option to switch from 720 to something like 480, how can you test something to make sure it’s not your end if you actually take away a feature that was fine to begin with. I get the times are changing and technology is getting more and more advanced, trust me, I was born in the age of technology’s very beginnings of taking over. Just fix the stability of the app please, is that so much to ask. And please just add back a 480p button just for the users who can’t watch in 720. While it often works and is still a very valid, not at all half-baked alternative to the website, it has been fairly unstable for me since day one. I’m nowhere near a frequenter of Twitch, just occasionally watch the streams of people like Vinesauce and Vargskelethor, but it’s become harder to handle since the new iOS update that changed the layout of the menu you get when you double-click the home button. Whenever I decide to play the stream in the corner of my screen, it pauses, and sometimes simply disappears. Today has been one of the worst days I’ve used it, as I can only spend, say, a minute on the app before it freezes up and forces me out. This isn’t the first time this has happened, either. Maybe the solid third time, and I’m fully unable to access the streams for more than maybe 20 seconds before it quits out. I’ve tried resetting my iPad and redownloading the app, but to no avail. I’m certain it’s an issue with the servers at this point, and a very pesky one. Please fix this as soon as possible, so I can actually use your app. Thank you. Using this app for years now and there’s been very little improvement over those years. The app allows you to do basic functions such as watch a stream, or tip bits. However if you want to do other things such as tip and subscribe you won’t be able to do that in the app. You will have to go to a PC or request desktop mode from the safari browser. When you request desktop mode it tends to cause problems for your fighting with the app opening and then trying to get the desktop mode painful process. Missing subscribe function is the biggest issue I’d say. Could this be true to be missing for so many years it’s just incredible to me. It’s a basic function on twitch it’s been around for a long time and that’s how you can show support for your favorite stream, same with tipping that should be in there too for some reason it’s not. Immobile multitask with us at the concert want to minimize itself and not going to wind up mode don’t have to force a question time 20 many bugs should’ve never been fixed. Other than that the most annoying bug is the crashing of the app. Looking at the app from a developmental standpoint, the app is terrific. Outside of little things like not being able to change your profile picture, everything seems to run smoothly. However after having the app for a while I noticed that my email for some reason wasn’t linked to my profile. I tried to fix it from The Xbox app on the console but no luck. Then since I was already logged in on my phone,I tried it there, still no luck. I then logged out and that’s when I really started to get upset. My password and login info stopped working once I logged out then the reset emails weren’t sending and kept saying my account doesn’t exist. I thought I would email and it would be a 2 day fix...wrong! I’ve sent roughly 10 emails in almost 2 months and nothing from them at all. I received a bot reply saying I hope the problem fixed itself, when prompted to email back if it isn’t. They again just ignored my emails. The brand new game I wanted to stream is now 2 months old and I don’t even want to play it considering now no one wants to watch it. Twitch Customer Service officially ruined playing my games while streaming. The previous version was better in that it would remember games I last viewed. Now, I have to scroll to find the game. Though I did hate that it always showed most recent and it was all or none when deleting them, but oh well on that. If it’s possible to creat a favorites games list I haven’t looked for it, but apparently it doesn’t stand out either, for me anyway. I hate the new continue watching feature. I understand some might like it, but the only reason I watch a rerun is because I can’t find anything live I’d like to watch. And the only way to remove the continue watching is to watch them, fast forward to the end, then go back or to watch the remaining part. Why can’t I just delete items while they’re in the continue watching area. Plus, I have something stuck in continue watching because I apparently need to subscribe to watch it, so I can’t go into it and watch it or fast forward to get rid of it. Either let me disable continue watching or give me the ability to delete from that area, not by having to go into the video. So, no issue with streaming performance, but either A) there is a LOT missing from the app, or B) it’s super un-intuitive and these things are impossible to find. Missing features include: - The ability to subscribe to a channel via mobile. - The ability to see existing subscriptions and when they expire. - The ability to change your profile picture. 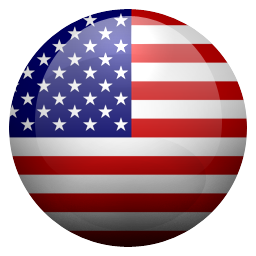 - The ability to easily get to a channel’s home page if they are live. (I am forced to go into the live video, often causing blaring audio even when my phone is silenced, and then have to poke around to find a way to get to the channel’s home screen and THEN I have to terminate the still playing video). - A means to set subscriptions to auto-renew. (Unable to find this on the web version either - maybe just a missing feature?). All in all, forcing me to log into the site severely inhibits the app’s on the fly functionality. I’d think these item would be a priority as the easier it is to manage things, the more likely people are to download/open the app. While not a huge amount of competition in this market, it just takes one competitor doing it better to start stealing people away. If these features are missing, I’d recommend adding them. If they are just hard to find, I’d recommend either re-thinking the layout or adding an overlay tutorial that walks through functionality for users. Something that launches initially for brand new users and can be launched at will for people needing a refresher. I used to get so many hours of enjoyment out of this app as a twitch prime member. I could channel surf with ease and go back and forth between all of my favorite streamers. I loved the freedom of being able to watch any streamer I wanted for 30 second or 30 minutes. 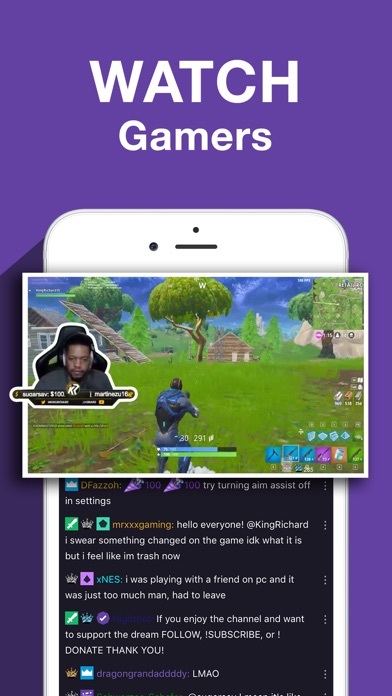 Now that they have introduced ads to twitch prime members, it makes this app almost unusable. To watch a 30 second ad almost every time I switch channels completely ruins the experience for me. I literally hesitate to open the app every time I want to watch one of my favorite streamers. I previously used this app for multiple hours a day and since the change I have only used it maybe 2-3 times. There needs to be an premium option to remove ads! Subscribing to individual channels doesn’t help. What I liked about twitch was the ability to watch more than a dozen streamers in a 30 minute watch session, freely surfing between channels. Please do something about this!! I want to use twitch again without ads! I would pay a similar price to what I pay for a Netflix or Sirius radio subscription to watch ad free. I absolutely love live streams, and twitch in general. I’ve been on the twitch bandwagon for longer than most, but can’t help to notice these extremely common, frustrating bugs. I will play live streams or VODs, and the audio will just go out. I used to be able to close out stream, change video quality, or close out app to fix it, but that is no longer the case. The only fix I have been able to find as of late is to completely uninstall and reinstall the app. I am now doing this 10+ times per day, and that’s unacceptable. If this issue isn’t solved by the end of this week, I’m just going to go watch someone else re upload one of your creator’s livestreams. Which mean that’s neither you, or the streamer you pretend to help will be making any money off of me, and I will cancel my multiple subscriptions. Please do something about the “Continue Watching” section of the “Following” home page in the app. I rarely ever want to watch anyone’s past streams and having a section like this is annoying. For example, because I watched some fool play for a few minutes last week, I’m now forced to see that stream at nearly the top of my feed and there’s no way to get rid of it. Or the section will be cluttered with a favorite streamer’s last stream that I closed out of pretty near the end of the stream, but for some reason the app thinks I might want to keep watching, so now I keep mistaking it as some new live stream when I launch the app. Basically, this “Continue Watching” section is misguided use of space in an application that’s all about live streaming. Hopefully, I’m not the only one raising this issue and something can be done about allowing the user to opt-out of having this section show up in the app. 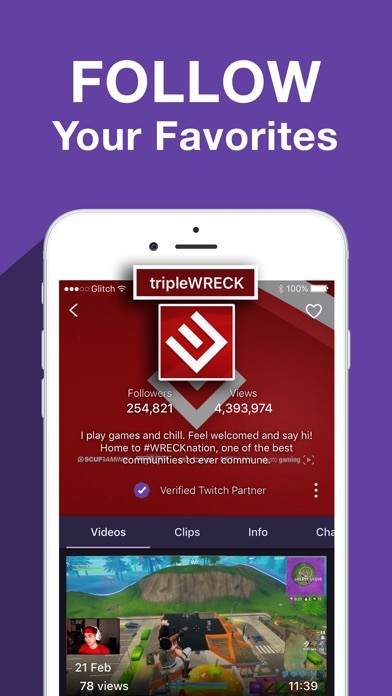 Please bring back the swipe left/right feature available in previous versions of the Twitch App used to change between channels. One bug I would like to mention is when you scroll down your follower list and select a stream and then go back to your follower list, the App bumps the list back to the top again. Almost every time I leave a stream and go back to the follower list it resets back to the highest viewer streams. What makes this especially inconvenient is many streams I like are Speedrunners who have viewer counts in the low hundreds and not the thousands like some of the big streams I follow. This bug/feature feels unintended and clunky it would be nice to return to where I was at in my follower list like a bookmark instead if having to scroll way down again. The Twitch website gives you a lot of access towards your customization and profile editing. You can change your chat color, change your name and or capitalization, change your profile pic, etc. This app, however, doesn’t give you access to most of the offers the website has. It would be nice to be able to do certain things on the app instead of always having to rely on the website such as customizing your profile and being able to subscribe to channels by viewing them instead of having to use chat commands. Sometimes I want to support a streamer but I can’t because they do not have a set chat command. Overall, I’d appreciate it if the app would have more accessibility just like the website instead of it feeling like it’s taking away your access and ability. Despite all the bad reviews that I’ve seen in internet about twitch app, I think it works fine. It has only crashed once or twice since I downloaded it (about a year ago) and I like it because browsing here is so much faster than the site and of course, unlike the “mobile friendly” interface, this one actually works! but still there is space for development, you can’t customize your account nearly as much as you can in the site, and you still can’t subscribe to your favorite channels or check your active subscriptions which is very important. I think what everyone’s complaining about isn’t that this doesn’t have good features, but it’s that this app still misses some of the very normal and expected features. Hurry up twitch! This app has been fantastic. I’ve loved using it as the interface is clean and runs well. Streams are smooth and chat runs without hiccups. However, the end of Twitch Prime being ad-free has changed the experience. The advertisements are way too loud, which means Twitch is no longer good for ASMR viewers and people who like to use this while falling asleep. Another major issue is that when closing the app to allow the stream audio to play in the background, the stream now either stops or gets choppy, rendering the function unusable right now. This issue needs to be fixed. Between the loud advertisements and background audio issues, I haven’t used Twitch app in a while. That’s a shame, because this is an amazing platform and the app has been solid. The app is overall great, but they need to add the option to DELETE messages in the chat room. Instead of always timing people out or just straight banning. I mod for a channel and sometimes I want to delete their message as a warning, but I only have the option to time them out or ban them, and sometimes that isn’t necessary. So please, people at twitch take this into consideration as some people do moderate channels from the their phone sometimes. 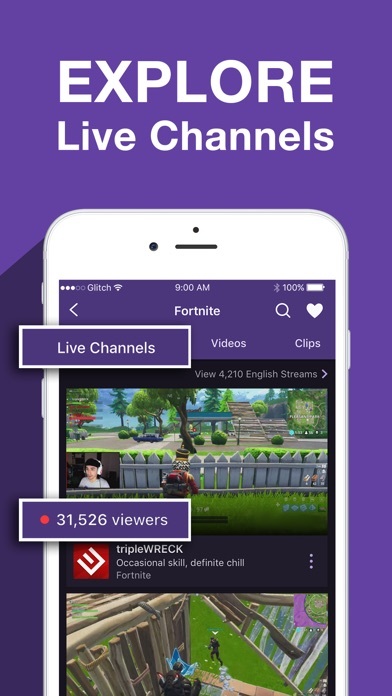 I happen to be on twitch exclusively through mobile at the moment and maybe their are other people to might agree? Other than that I have no real complaints. The interface is nice. But I would really love to see that small feature included when you press on someone’s name. Thank you. 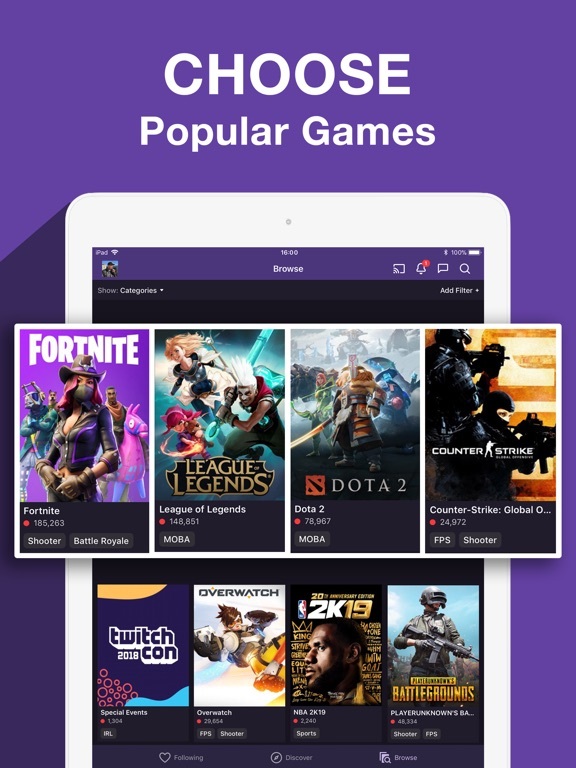 Imagine you’re browsing twitch’s front page for the game you want, it’ll be there, but there won’t be any chance those games will be in order of how popular they are. Say you find your favorite game and you want to see who the top streamers are, you’ll have to scroll and scroll past the lowest in popularity streams to find the top three you were looking for. However, with all that being said, there’s the option to filter which type of media you’re looking for: Live-streams, clips, and videos. Why? Hold that question for this next one. Not only can you filter media, you can filter by which stream labels the streamers have attached to their stream! 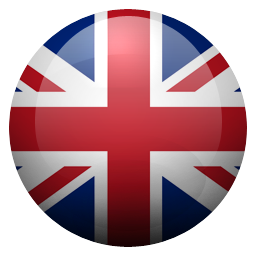 Looking for a non-English speaker in a mostly English web? You’d better hope they labeled their stream with that language to have any chance of finding them. TLDR Ads bad. But not cause ads, because bad numbers. Twitch continues to add new, convenient features without fixing their buggy video system. While I don’t mind getting hours of content for one measly ad (despite them being horrible pandering, playing over and over,) having to watch an ad on a video I was already watching just because I swiped a little too hard feels harsh. Losing my progress on my video just because one ad played is infuriating, especially when it happens over and over, and is even more frustrating for users with short term memory loss. Two (2) other things that cause this bug (along with others:) Closing Twitch, auto going into Audio Mode, reopening twitch and losing the play/pause button, meaning you have to close and come back, with a 1/3 chance of actually getting your progress back. Changing quality when the video won’t get past the frozen screen it shows you. (By the way, Auto starts in the highest quality and is pointless if you’re looking for what will work with shoddy internet. Because it doesn’t ever start!) Haven’t ever used your popular stream tabs because I only watch content I actually want to see. Probably bugs there too. Sometimes I wish Hitbox took off. Twitch seemed to be almost flawless, but there should be a limit to each game and how many people can stream at a time. This causes the whole site be really slow and makes the one I’m watching buffer a lot. It would be a simple fix and I feel it there would the people who stream non-stop would take all the spaces, therefore there should be a limit or a quota that streamers need to stay within. If they don’t their accounts will be suspended do a good while. The most I see for a person to stream in a day is no more than 6 hours. That’s a fourth of the day, I think that’s plenty. I understand you deal with a lot of things already, so worry not. I have the patience of a saint. I’ll wait, and take all the time you need to settle this. Thank you and keep up the great work! I only rate this low because the app has some problems. For instance, the stream I am watching will freeze from time to time and I have to close the app in order for it to unfreeze. Also, the app has a tendency to not update when ever you pull any menu to refresh. One other thing as well, I only notice this with my streams, whenever I have my stream pulled up on the app, in case my chat doesn’t work on my second screen, whenever I log it out on my computer and shut it down, it still shows myself logged in and streaming on my phone for a good 5 minutes before showing me offline. Now I do not write this in anger or dismissal. Merely informing you of some of the things I have come across. Once these bugs are worked out I will give a better rating. Thank you for your time and have a nice day. So the app itself works just fine for my usage but the biggest problem is how laggy the streams are. I’ll be watching the same stream over stable WiFi on my computer and on my phone and the computer will have a 3-4 second delay while the phone has a 15-20 second delay. I’ll watch chat replies to the streamer pop up 7-10 seconds before I hear what they were replying to. The videos and audio freeze constantly and randomly it will “jump ahead” to get back to live and I’ll end up missing parts of what the streamer said. No matter if I’m on strong WiFi or full bars LTE data, I either have to watch in 160p or Audio only because otherwise it just freezes constantly. I’ve had this issue over multiple phones for multiple months. I really hope they fix this. My main problem is the audio only setting. When I have the streams on audio only, it sometimes will crash or will 'pause' the stream, thinking I'm listening to something else when I'm on something like my email, or playing a game on my iPod that's compatible with listening to both the stream and game audio at the same time. Other times, it'll crash, and I don't like that. Streams will also stop and have a brief moment of nothing happening and just being a black screen. Audio only option doesn't work, either, unless I stay on the screen. But if I go to tumblr or something, the audio will pause and won't play until I go and sit on twitch again. One of my favorite things to do in my free time. I LOVE live-streaming, I love to just play games while interacting with some of my fans chatting with each other. This app is almost perfect, but I do have one problem. When I watch livestreams, it freezes every 15-30 minutes. It wouldn’t be a big issue if I wasn’t a speed runner who likes to look at my chat. Because I have to watch my streams to check if everything is okay and talk to the chat, I have to have my stream loaded up on my phone. But I have to stop and refresh the stream every time it freezes. It wastes my speedrunning time. It just a stupid nitpick but I just need to point it out. I don’t know if it’s my internet but yeah. I rate this 4 Stars, obviously. I’ve been a fan of twitch for almost 2 years now. So much that I decided to download the app on my phone to watch my streamers while I’m not doing anything at school. But I have plenty of issues with the mobile app. For starters, the MAJORITY of the streams I wanna watch freeze up when I click them, even after restarting the app. Second, the streams that will play for me lag 100% of the time. And I know for a fact that it isn’t my internet. I have LTE full bars, in a city that uses the same provider I use. And every other app works perfectly fine. Third, this app always crashes after I’ve been using for me than 20 min. Not a fan of the app. But Twitch in general on PC, I love it. If it gets fixed, I will most definitely 5 star this app but until then, I’m not satisfied. Get it fixed, please. Edit: This text issue is solved, working better now! Needs improvements on minimized mode. Trying to watch streams with other apps open is a pain, if I switch to another app while watching the stream will not stay open and the mini window closes after a short time. Also, stream lags and is delayed after a while and switching quality seems to alleviate it for a while. [Original] Worked fine until recently, chat that comes through is fine and readable but text you are actively typing to chat is black on a dark background and you can't read what you're typing. Seems to activate after using emotes in the chat. 99% of the time my streams either don’t start, or get cut off like 15 minutes in. I love this app and it has worked great for me in the past but recently it hasn’t been loading live streams correctly. I’ll tap on a live stream and it’ll either take forever to load and then just pause out of nowhere during the stream and take forever to load again or it just never loads and I get a black screen. Also, when the stream does load, I can’t play it at 1080p res like I used to, I have to put it at like 480p for it to stream smoothly and that’s never happened before and I know it’s not my internet because everything else loads fine. I hope this gets fixed! Great! but DEFINITELY needs some work. 1. I use this almost daily to watch overwatch content (and some other things). With the new update it allows you to watch ads to earn bits (+2 per ad) and suddenly the button disappeared. I had donated 202 bits to the overwatch league and planning to get 300 bits donated (for in-game items). I’ve uninstalled and reinstalled over 4 times to no avail of the button returning. 2. The web browser side is far superior compared to the app. The extensions to see viewers location was cool and all but I feel like the something like what the overwatch league has on their web browser twitch page would be great. That way, I do not have to go back to the web browser to check the global progress (in bits). It is not the app it used to be. Before the streams would never freeze and there have been many updates but none have addressed this issue. If you want to watch twitch you are way better off watching on pc. The streams constantly freeze and you have to reload the stream. The audio and stream will get off and be laggy and you have to reload the stream. If you’re not subbed or have twitch prime when you reload the stream more often than not you will have to watch ads and then you get stuck in a endless loop of streams freezing and having to reload them and then having to watch ads. It seriously gets so frustrating. Definitely wouldn’t recommend watching on the app until this issue gets fixed which it hasn’t in 6 months so it probably won’t ever get fixed. Can’t get notifications to work? There are a lot of streamers who I love to watch on twitch and you can find good things to watch, and that of which I applaud. But the reason I’m only giving three stars is because for some reason I haven’t been getting any notifications on my app(iOS). I’ve tried as much as I could, including deleting the app and reinstalling, logging out and back in, checking my profile online, going into settings, looking at other problems people have seen and I can’t figure out why my notifications aren’t working. This makes wanting to catch a stream of like to watch hard and disappointing. I’m not sure if anyone else has a similar problem, but that’s my issue. Great app, but bit ads aren’t great. I have enjoyed this app alot, and many troubles i’ve seen with other users i never got. This however, doesnt help. I dont pay money for bits, and rely exclusively on ads for my bits. My problem with them begin with constant “interactive” ads, which just have you click the screen then rate how you felt. That problem stems from the fact that some regular ads are more interactive than the interactive ones. But that doesnt end it. Some of these interactive ads are repetitive. I had one session in which i clicked for an ad, and it asked if i was a mother with a child between the ages of 16 and 22. I said no, then it asked my age and gender. I put my age and that i was a male, and it gave me an ad correspondingly. Well, that same ad came up for the rest of the session i was trying to get bits during. Not to add to it that these ads dont always give bits. I’ve found it to be a half of the time. Normal ads will always give bits if you get a normal ad. These have grown more prevelent. Thank you for your time, and have a nice day. I’ve only just begun to build my streaming base and start finding out who I am as a twitch streamer. But I can say this, it is absolutely amazing. It’s always an awe striking night whether I’m watching someone’s stream, playing with one of my buddies in custom matches on their streams or having a good time making a fool of myself on my own stream with the few who come to be entertained. I love doing it and can’t wait to grow and be able to offer more to all my viewers as well as to see what twitch comes up with next. Thank you guys for all you do and all your working hard to do in the future. I love having twitch on my phone I get to watch my favorite streamers on the go but since they updated to the whole new look for it. It hasn’t been functioning correctly. I will tap on a channel to look at past broadcasts to the info on the stream and it will just freeze and won’t let me click anything. I have to close out of the app all together and even that takes time to fully close. And it isn’t the same channels one day a channel could work perfectly fine and the next it doesn’t. I give it 3 stars instead of 4 because this has been happing since the whole appearance change of the app and they haven’t done a single thing to fix it. The app is great I have no complaints aside from a couple things I had trouble navigating to but it’s probably user error or that I can’t access everything I can on the website. PLS FIX STICKERS... why is the quality of some of the stickers so bad. Some of the stickers are very poor quality. I’m talking about the stickers we can send in text messages. For example KappaPride is high res but Kappa is very low res and so is :BabyRage: I don’t understand why all the picture qualities of the stickers aren’t 💯 seems kinda odd that the stickers aren’t all good quality. Should be an easy fix thanks. I love it steaming is soo cool on hear I just love this keep up the good work don’t give up on twitch ever I love twitch love you bye just saying a lot of people play on twitch they love Twitch I have soo munch friends like six of them I love twitch I now I said that way to many times but I just love it yes yes yessssss just want you to change when you get friends can you have more then six friends because I went on twitch and it made me unfriend them I didn’t do it on purpose I just want you to change it thank you Love Me. Will show me the streamers that I'm following but crashes when it scroll down to the ones that are hosting. That means that the app instantly crashes when none of them are currently live. When I delete the app then download it again, the first time I open the app it shows all the streamers I am following and the ones hosting and offline with small little icons and it works fine. Until I want to go back and change what I'm watching or if I close the app then reopen it or if there is lag of any kind. Then when I reopen the app all the icons are huge and the app crashes on the hosts again. I have to completely delete the app and download it again every time I want to view something else or I close and reopen the app or if there is lag. It has become unusable. 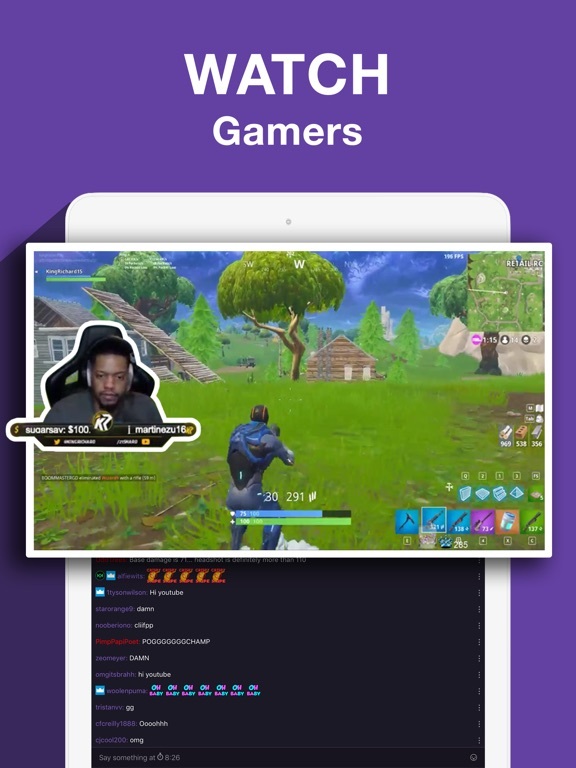 The Twitch app is so good. I honestly probably use it more than the actual website when I am on my computer. The app is very clean, easy to use, and looks great overall. No ads either which is a huge plus. I do however have some complaints. I miss the swiping feature they used to have. It was so easy to go from one streamer to the other with ease. Now i have to take it out of theater mode and minimize the stream, and then change to someone else. I get that it could be annoying when accidently swiping, but at least make it an option in the settings to turn it on and off. The other complaint i have is very minor, but on the Iphone i can no long see my battery or time when i tap the screen in theater mode. Not a big deal, but it was nice being able to see that stuff when i’m watching Twitch for long periods of time. Overall it’s a great app, probably the best in the app store being free, and I frequently recommend it to others. This app is a lot of fun and well organized but it has some major flaws. It often randomly closes out and is unstable sometimes, and it’s not one of those apps that when they close out you can just access them back, once Twitch crashes, you can’t get back on most the time. I have tried getting in five times in a row and and it haven’t been working. Also the chat and video are slightly delayed but that’s not a huge problem. If this app was stable I would give a 4 no doubt and I would highly consider a 5. So if you aren’t watching on a pc or a relatively stable mobile device, don’t even bother with downloading this app. 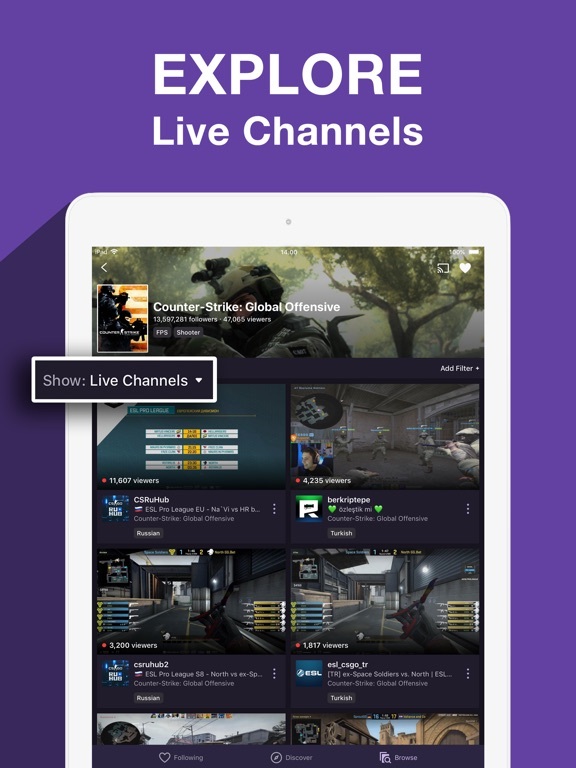 It’s a great app to watch live gameplay from streams whenever you want. Though recently there has been a problem with freezing as I watched past broadcasts videos or even going on a streamers page and having it stop working until it boots me out of the app. 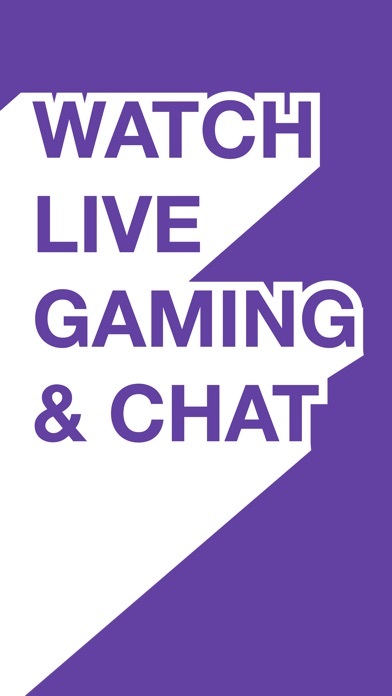 This is my only complaint about it, the app is very good, when you watch a stream it timestamps when you got off the stream so you can go back to watch it where you left off, and you can have a live chat now that they added this for the app too. To end it off, It’s good but it freezes at times.